Ventry is situated in the most beautiful corner of Ireland’s south-west, within easy reach of Swansea-Cork Ferries and Kerry Airport. A safe blue flag beach, hill walking, fishing and golf, along with excellent traditional restaurants and pubs, make Ventry the ideal base for a complete holiday. Arriving in Dingle Town, turn left on the first roundabout coming from Tralee/Killarney. Follow the waterfront for 1 mile until the next roundabout. Turn left, over the bridge and follow signs for Slea Head Drive. 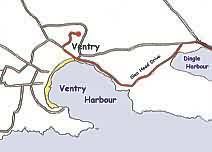 After 4 miles you arrive in the Village of Ventry. Go past the Ventry Inn Pub for 200 metres, take the right where you are signposted, now just follow the signs. Take the N19 on to the N18 to Limerick. Then the N69 to Tarbert – Listowel – Tralee.